The hairpins up to Alpe d'Huez connecting the town of Le Bourg-d'Oisans in the valley to the ski resort over 3,000 feet up above are part of cycling legend. 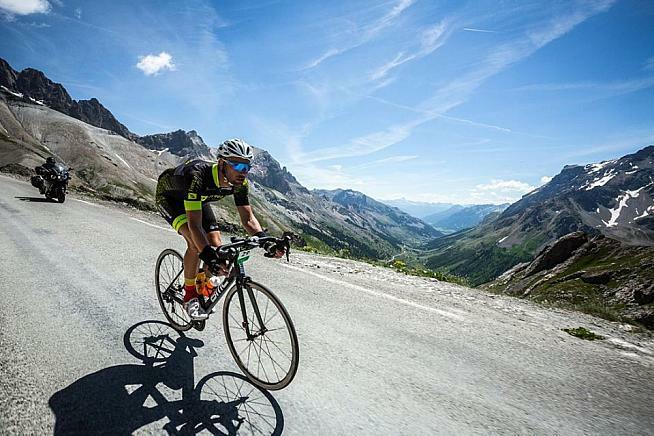 For riders of La Marmotte the 21 bends are the final challenge after the Col du Glandon, Col du Telegraphe and the awe-inspiring Col du Galibier, one of the highest paved road in the Alps topping out at 8,668 feet / 2,642 meters meters. The struggle up the "Alpe" counting down the corners from 21 to 0 (8.2 miles / 13.2 kms at an average of 8.15%, max of 13%) is the triumphant finish to a monster of a day full of climbing, effort and often tears. In all, the Look Marmotte Alpes, to give the event its full name, covers 105 miles / 174 km with 16,990 feet / 5,180 metersof climbing. 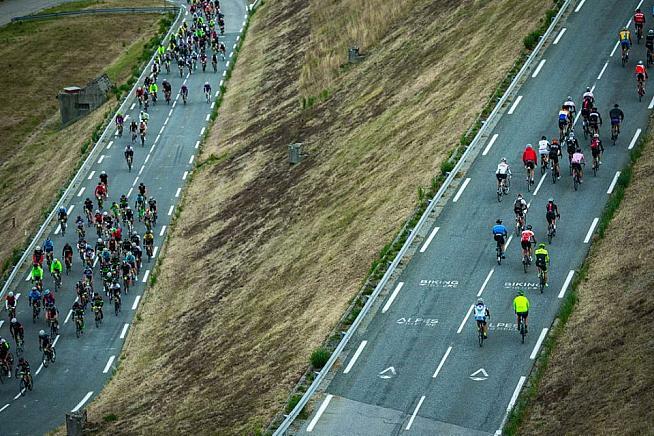 And every year it's a 7,500-rider sell out with almost 90% coming from outside France to test themselves. It was a test I failed. Four years after I had crawled up to Alpe d'Huez in a state of exhaustion and emotional collapse, it was horrible to be ferried up the famous slope in the broom wagon in the early evening. To the left of the bus were an endless stream of happy riders descending with medals around their necks with the grins and looks of satisfaction that I thought I would be enjoying by that time. On the right were the battlers of the back end of the field churning their pedals with whatever they had left 12 hours after the event had started. Each one causing me to think: "Well, if they are still going why aren't I?". My training had been great and I honestly believe I was in the best cycling shape of my life. That was a relatively low bar to clear, but given that I had completed the Marmotte - if extremely slowly - as pretty much a novice I flew to Europe with a target of doing a reasonable time and not just getting round on willpower. The cycling gods are fickle. 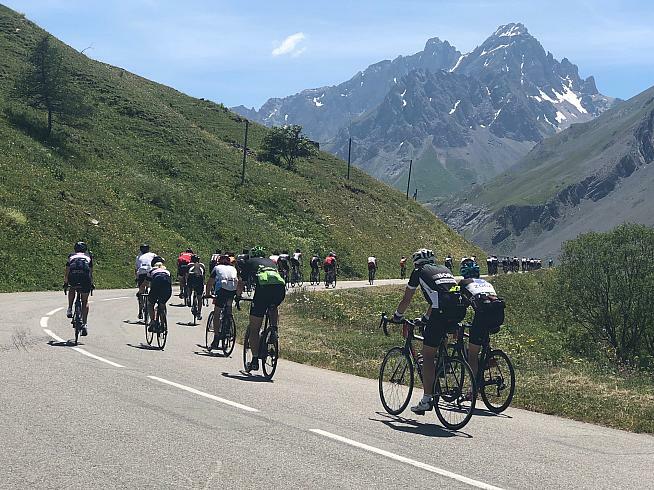 A couple of miles above the food stop near Valloire, in the hollow separating the Telegraphe and Galibier climbs, I steered onto a wide section of gravel on the side of the road, got off, sat down and called it quits. I wondered whether I was going to throw up. It had started so well. 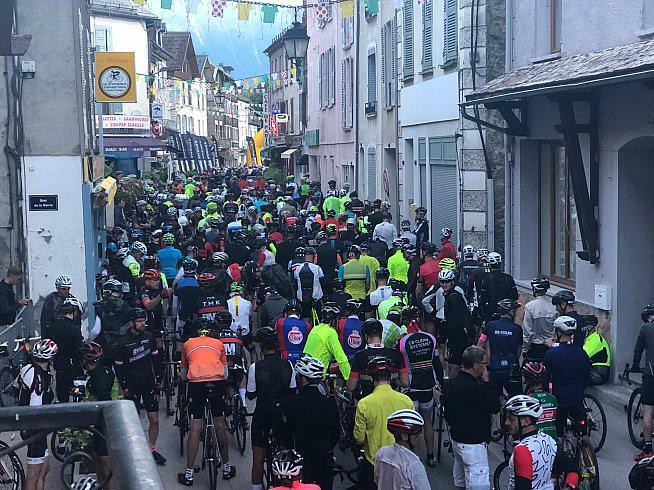 The mad dash from the start line in Bourg down the valley to the base of the Glandon climb was slightly less mad than it might have been and with my sensible helmet on I spotted a tall rider creating a nice hole in the wind and tucked in behind him for most of the way. My buddy Joe stayed on my wheel while Rune, at home surrounded by so many of his fellow Danes, disappeared up the road. On the climb itself (3,780 feet / 1,152 meters over 15 miles / 24 kms at an average of 4.8% with a max off 11.1%) I played it conservatively as planned and stayed around my target power. The conditions were almost perfect and even the steepest section after the sharp descent around halfway was taken in stride. The only wispy clouds in my thus far blue-skies ride were a slight suspicion that I was not going that fast. The food stop at the top of the Glandon was its usual chaotic self. It did, however, provide one of the world's best men's rooms. I stopped again briefly at the base of the neutralized descent into the Maurienne valley. The organizers' wisdom in not including the descent in the official timing for safety reasons seemed vindicated by the three crash victims I passed. I reconnected with Joe and together we rode along the floor of the not very pretty valley. We did okay in finding groups to ride with and at least had each other to rotate the work when on our own. I had remembered this 16 mile / 25 km section as flat. It isn't. 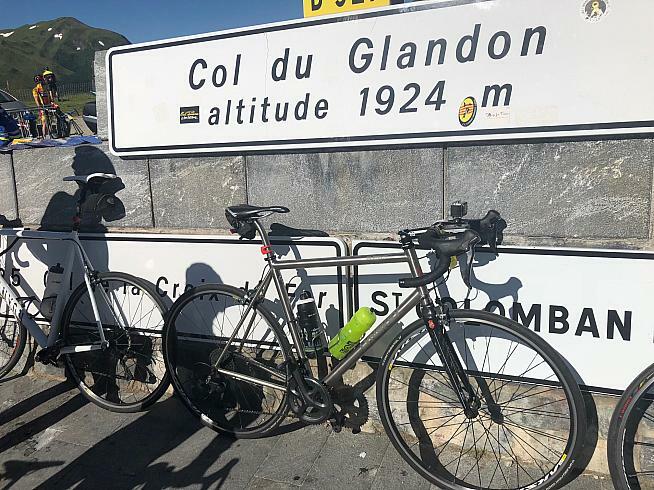 We made final stop at the water station in St Michel de Maurienne to top up bottles and then hit the slopes of the Telegraphe (2,808 feet / 856 meters over 7.3 miles / 11.8 kms at an average of 7.3% and a max of 9.8%). In 2014 it was towards the top of this climb that my Alps experience has mutated from "this isn't too bad" to "where's the top, too hot, why am I doing this?". This year it became glaringly obvious that I was having problems on the lower sections of the climb. If you ride enough you get to know how your body feels and it's normally pretty easy to estimate speed, heart rate and power to a surprisingly accurate degree. I knew I was in trouble when my breathing, my legs and the sweat pouring off me were telling me I had to be pumping out the power but the little screen on my bars and the people streaming past were telling a very different story. I enjoyed the descent to the pretty village of Valloire and undid all the beneficial effect by making a stupid mental error. I remembered the food station as just past the village whereas it is a couple of miles of stiff climbing past it. At one point I thought I had somehow missed the rest area and in the heat I started feeling worse and worse. Taking on fluids, a couple of ham sandwiches, a fistful of sweets and even a soak of the feet in the river all helped to perk me up. Just as I was about to depart Joe arrived and was clearly not enjoying the temperature, which was very warm. I suggested he grab a cold Coke from the hotel opposite and counselled him to be sensible if he was not feeling well. 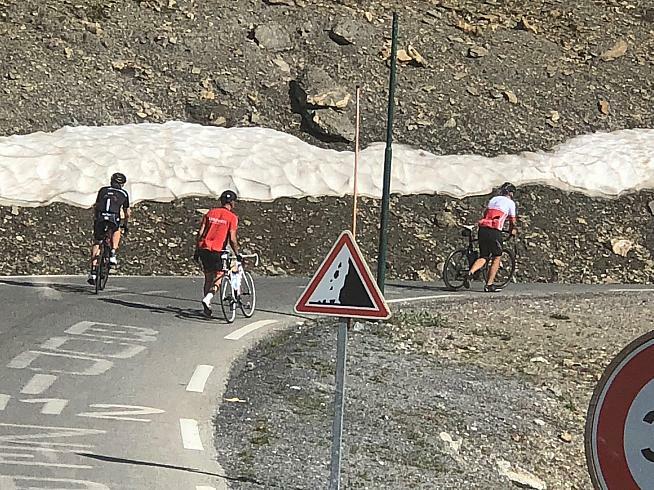 20 minutes later as I sat on the gravel watching the stream of riders head for the top of the Galibier (11.2 miles / 18 km, 4,085 feet / 1,245 meters at 7% average and just over 10% max at the summit) he texted that he was abandoning. A few minutes later I let him know that I too was pulling the plug and I freewheeled back towards Valloire. As soon as I had left Joe the doubts had swarmed. I was working harder and harder for fewer and fewer watts and the voice telling me I didn't have to destroy myself for another three-four-five-six hours got louder and louder. 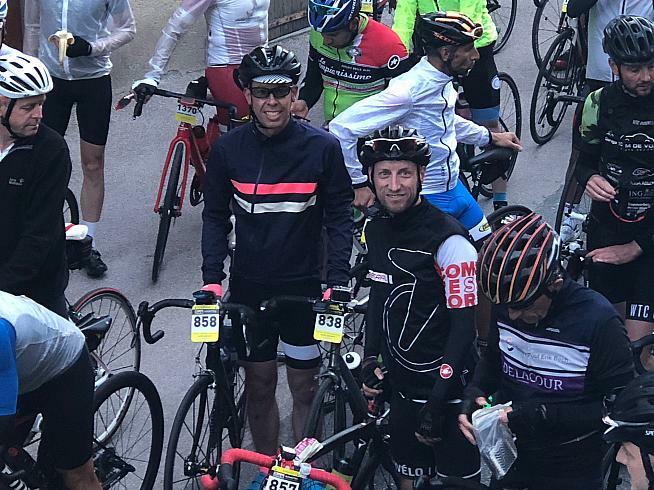 It's always been a point of pride for me that I had previously only not finished one gran fondo (I did throw up a couple of times on that one as I hadn't shaken a virus and still rode back to the finish, just bypassing a very steep hill) and cut short only a handful of long training rides. It was with very mixed emotions that I climbed off the bike and the sense of disappointment will linger for a long time. Joe had found himself a table in the hotel garden. We waited in comfort sipping Coke and then beer for our transportation to arrive making slightly forced conversation. Hours later when the small bus did finally arriveit was obvious that the trailer was far too small for the number of bikes. Half had to be maneuvered between and onto the seats inside the bus. We were a mixed bag. There was a young Danish couple, four or five French, a similar number of Brits and a few others. We ranged from the youngish to the quite old with the bulk of us in middle age. I would love to tell you that the smorgasbord of ages, sexes and nationalities bonded in our misfortune, swapped contact details and vowed to conquer the Marmotte together in 2019 prompting Disney to buy the film rights. Imagine the casting choices! The montage section of the training would be awesome and perhaps He-Who-Must-Not-Be-Named could have a cameo as the coach (Mellow Johnny?) who takes us under his wing. Enough. The reality was a much more prosaic mix of a small amount of desultory conversation, a bit of exchange of tales of woe and disappointed silence. My disillusionment was put into perspective somewhat by the devastated British guy who had suffered five punctures on his carbon rims and wrecked both wheels as a result. "I trained for a year," he lamented. A Kiwi with carbon rims had called it a day after four blow outs in the heat. Another Brit flatly admitted that he had never ridden in the Alps before and was simply unprepared. His bike had a massive amount of kit on it - iphone mount, Garmin, bag on the top tube, backpack-sized saddle bag and huge water bottles. An older woman referred to a foot injury and was being encouraged by her husband or partner. I presume it was her other half or she'd made a very good friend on the ride. 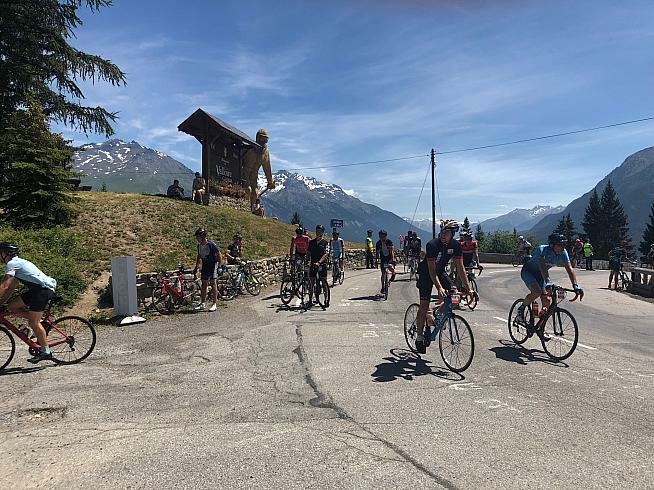 With bikes strewn everywhere, we stopped and started and waited, and waited some more as we made our way up the Galibier before taking the tunnel just below the summit of the col. The delays were lengthy and there was much muttering and some louder complaints. I felt it was appropriate punishment for dropping out and sat in silence. The only exchange I had with the guy sat next to me was when he excitedly tapped me on the shoulder and pointed at what he said was a real marmotte on the mountainside. I nodded although I could not make out the beastie and went back to churning through my capitulation over and over. Could I have gone on? Had I given up mentally rather than physically? Could I have made it over the Galibier and coasted down the long, long descent on the other side? Had I been overconfident in my form and simply crumbled when reality hit home? Could I have just ground up Alpe d'Huez like last time? Had I wimped out or had I been sensible? Both? As we lurched around the hairpins of the Galibier a bit of banter between a youngish Frenchman at the back of the bus and our driver Michel lifted spirits and distracted from the non-zero probability that having been sensible and stopped I would now perish in a mountain bus crash. Ignoring the sign "Ne pas parler au chauffeur", the joker repeatedly called out "Tranquille!" (Easy!) with Michel chatting back and assuring him that he had 2-3 million kms of commercial driving under his belt. There was another major delay at the base of the Alpe as we disembarked those staying in the valley and loaded on twice as many. The new passengers included an English speaker with a difficult-to-place mid-Atlantic accent who proceeded to issue a non-stop stream of drivel loud enough for the whole bus to hear. Six times he asked whether he was on the right vehicle and received the same answer each time and by the third time he announced that he had never intended to do the last climb because he did not really like it my thoughts were turning to physical violence. 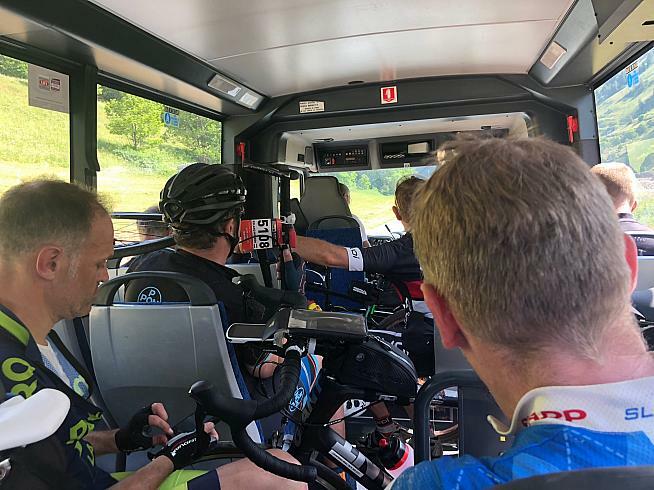 Given the cramp that struck 20 minutes later as we labored up the hairpins in convoy with a much larger bus also carrying stragglers it was probably for the best I hadn't tried to hurdle the bikes clogging the aisle of the bus to reach him. 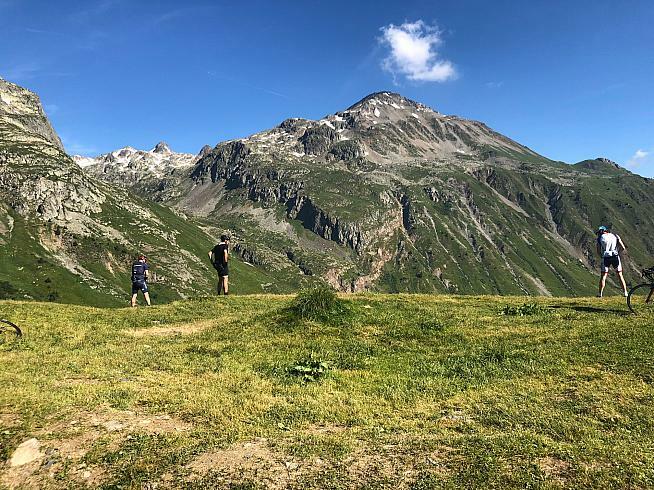 What we could all agree on is that the Alps are stunning, riding in them is something everyone should try and do and that the Marmotte is a glorious monster. The old adage is that a DNF is better than a DNS. As a victim of the monster I am still figuring out whether I buy it.